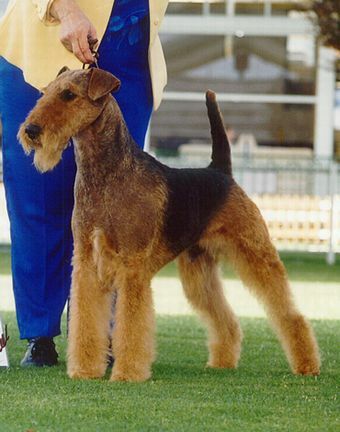 Justis has won more at Royal shows in Australia than any other Airedale in the History of the breed. At the biggest Royal, Melbourne, he's been third in the whole show (BIS 3rd), Best Terrier twice and Best Airedale 4 times. He's also been best Terrier at Canberra and Runner up Terrier at Adelaide (twice) and Canberra as well. His Best of breeds at Melbourne, Sydney and Canberra are too numerous to list. Justis has won BIS at the Airedale Club of Vic. twice and NSW twice. Some of his all breeds Best in Shows have been at shows with over 1,500 dogs. Justis is the sire of many champions including the first airedale to win BIS at a Royal Show Ch Old Iron Thorpedo. Ian, like Justis is a Victorian Airedale Club BIS winner. His daughter Norwegian Ch Old Iron G'day Stall Mascot is a Nordic Winner and Aust & American Ch Old Iron Full On CD won Opposite at the Californian Specialty. Justis hip score is 4 and his elbow grade normal.